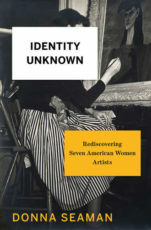 Donna Seaman, author of Identity Unknown: Rediscovering Seven American Women Artists in conversation with Richard Wolinsky. The art world has not been kind to women artists. Being taken seriously, getting exhibited, getting remembered after their deaths: none of this happens automatically. Donna Seaman, book critic for Booklist, takes a look at seven twentieth century American woman artists whose work has been somewhat forgotten in the years since their deaths: Louise Nevelson, Gertrude Abercrombie, Lois Madou Jones, Ree Morton, Joan Brown, Lenore Tawney and Christina Ramberg. In this discussion, Donna Seaman talks about each of these artists and how they related to the world and to art. She also talks about the recent controversy over the Bull sculpture on Wall Street, on sexism in the arts, and on the pull between artistic freedom and stylistic fads.